Marimekko's spring/summer 2015 collection is the first line by Finnish artist and designer Kustaa Saksi. The characteristically bright array takes on an under-the-sea theme, and features variations of two prints—one inspired by sea anemones and the other by sea grass. 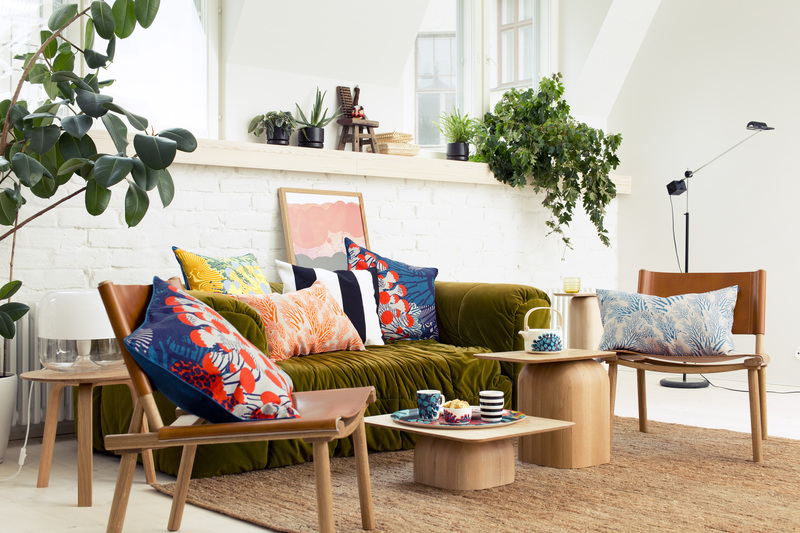 Marimekko's spring/summer 2015 home collection, the work of Finnish artist Kustaa Saksi, features patterns and products inspired by the sea. The Merivuokko print features forms that resemble sea anemones. The same print makes its way onto mugs, teapots, pillows, bowls, and plates. Another print from the collection, called Meriheinä, depicts a kind of sea grass. A close-up of the Meriheinä print.